Autumn is the time of engineering events and this year, Italy's Consiglio Nazionale degli Ingegnere is honoured to host the 2017 edition of the World Engineering Forum - WEF, due to take place from 27th of November to 2nd of December, 2017, at the Congress Center “La Nuvola”, in Rome (WEF2017 - www.wefrome2017.com). This World Engineering Forum will take place on the ocassion of WFEO's General Assembly. Engineers coming from all over the will have the opportunity to meet and share each other's experiences. These forums are nothing without the contribution of all our profession. On such grounds, we make a call for papers, in order to enable the dissemination of ideas and proposals to all the engineering community. The main theme of the Forum will be:“Safeguarding Humankind’s Heritage".Engineering’s commitment is to help material wealth within a sustainable development perspective. Technological research and smart applications should support countries in safeguarding material, social and cultural heritage of each community of people. The second annual Multi-stakeholder Forum on Science, Technology and Innovation for the Sustainable Development Goals (STI Forum) took place on 16-17 May 2017 at the United Nations Headquarters in New York. The theme of the 2017 High-level Political Forum on Sustainable Development (HLPF) is "Eradicating poverty and promoting prosperity in a changing world", and the Member States have decided that the HLPF 2017 shall focus on six SDGs (1, 2, 3, 5, 9 and 14) in addition to SDG 17 that will be considered at each HLPF. In this context, the following topic may be considered for the STI Forum 2017: "Science, Technology and Innovation for a Changing World - Focus on SDGs 1, 2, 3, 5, 9, and 14". WCCE was represented by our President, Alfonso González. The objective of our attendance is to show the commitment of WCCE and its members organizations to UN's Sustainable Development Goals and contribute for its accomplishment. 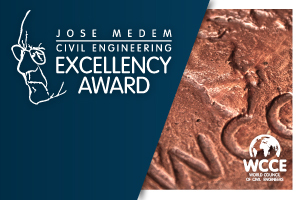 WCCE launches its fourth edition of the Civil Engineering Excellence Awards. The first presentation of the Award was made in 2010 during our 5th General Assembly of WCCE. This fourth edition's awarding ceremony will be held during WCCE's 12th General Assembly to be held in Antalya, Turkey on the last quarter of 2017. Candidacy submissions are open until July 15th.